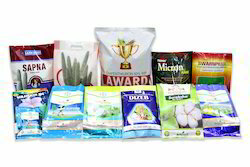 We are a leading Manufacturer of seed packing pouches and agrochemicals packaging material from Hyderabad, India. e are a known firm engaged in manufacturing and supplying Seed Packing Pouches. These are manufactured using premium quality raw material so as to maintain the pure savory and aromatic qualities of the seeds. Common structures available for the product are PET, FOIL, POLY PET and POLY. These pouches are used to pack various seeds such as, vegetable seeds, crop seeds, gerbil seeds, fruit seeds and oil seeds. e are a known firm engaged in manufacturing and supplying Agrochemicals Packaging Material. These are manufactured using premium quality raw material so as to maintain the pure savory and aromatic qualities of the seeds. Common structures available for the product are PET, FOIL, POLY PET and POLY. These pouches are used to pack various seeds such as, vegetable seeds, crop seeds, gerbil seeds, fruit seeds and oil seeds.